NC State's multi-talented Jaylen Samuels could be all over the field in 2017. 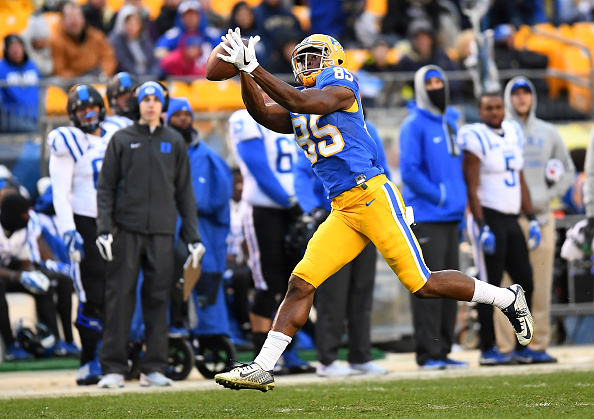 We’ve talked about quarterbacks and running backs earlier this week, so now it is time to take a look the tight ends and receivers. Here’s everything you need to know about all of the talent that the ACC welcomes back at those positions. Q. Who are the top returning receivers in the ACC? 4. Cam Phillips, WR, Virginia Tech – Looking at the numbers, Phillips is the top returnee in the league. Last season, he caught 76 passes for 983 yards and five touchdowns. He also stepped up his play against top competition, averaging nine catches and 100.5 yards per game versus ranked opponents last year. With Isaiah Ford heading to the next level, he should have no trouble eclipsing the 1,000-yard barrier this fall. 3. Ahmmon Richards, WR, Miami – One of the most pleasant surprises in college football last year, Richards made an immediate impact for the ‘Canes, breaking Michael Irvin’s school record for receiving yards by a freshman. He was definitely one of the more productive wide outs in the league, averaging 19.06 yards per catch, with 38 of his 49 receptions resulting in a first down. His presence in the lineup will prevent opposing defenses from trying to load the box to take away Mark Walton and the running game. 2. Jaylen Samuels, TE/HB/FB/WR – No, that’s not a misprint – Samuels can play every one of those positions. He’s an effective running back, rushing for 700 yards (6.7 ypc) and 16 touchdowns in three seasons. He’s also an excellent receiver, catching 55 passes for 565 yards and 7 TDs last year, highlighted by a 104-yard, 3 TD performance against Vanderbilt in the Independence Bowl. Wherever Samuels lines up this year, expect the offense to get the ball in his hands early and often. 1. Jester Weah, WR, Pittsburgh – Why is Weah at the top of the list? Simple: he made more big plays than anyone else last season. He ranked second in the nation in yards per catch, averaging 24.17 yards per reception. More impressively, 11 of his 36 catches resulted in a gain of 30 yards or more, with six of them netting more than 50 yards. It’s hard enough to do that on PlayStation, let alone the likes of Clemson, Virginia Tech, and Miami, which all finished in the top 20 in total defense last season. While the law of averages suggests that his yards per catch numbers will go down, expect another big year of Weah again in 2017. Q. Which player is due for a breakout season in 2017? I’ll go with Jaylen Smith of Louisville. He’s played well during his time at UL, catching 56 passes for 975 yards and six touchdowns. In addition, he was the Cardinals’ top deep threat last year, averaging 22.19 yards per catch. With James Quick, Cole Hikutini, and Jamari Staples departing, look for him to become Lamar Jackson’s favorite target this fall (although Dez Fitzpatrick looked very impressive in the spring game). Q. Who is the top newcomer to keep an eye on this fall? Syracuse tight end Ravian Pierce narrowly edges out Fitzpatrick for this distinction (although both should have great seasons). One of the top JUCO tight ends in the country, Pierce caught 76 passes for 727 yards and 6 touchdowns in two seasons at Southwest Mississippi Community College. He seemed right at home in Dino Babers’ scheme, earning the starting job and catching two touchdown passes in the team’s first scrimmage. Expect him to have a big season and to help replace the huge void left by Amba Etta-Tawo, who is now a member of the Jacksonville Jaguars. Q. What is the most intriguing situation at wide receiver? Without question, it’s North Carolina. After all, the Tar Heels lose Ryan Switzer, Bug Howard, and Mack Hollins this fall. While Austin Proehl has proven to be a dependable receiver (70 career catches, 928 yards), there’s no one else on the roster with significant game experience. That doesn’t bode well for an offense that already has the burden of breaking in a new quarterback. Will some new players emerge to keep Fedora’s offense rolling like a well-oiled machine or will the ‘Heels take a big step back?